Anything to Get the Kids to Read? This seems to be a new mantra that has sprung up among parents and educators over the last few years. I’ve heard it many times– said with an almost religious fervor –as though a child who doesn’t read is in the same immediate danger as a child who doesn’t eat. And whenever I hear this statement made with such intensity, I can’t help but think, “Anything to get the kids to read? Really? Anything?” Just how far are we willing to go for the sake of reading? On another occasion, a Christian father and I were discussing the new movie and book, Twilight. He was planning to allow his “tween-ager” to see the movie in hopes that she would then read the books. He had made this decision, not because he thought the subject matter of the books or movie would be good for her (in fact, he indicated that he had decided to allow her to see it against his better judgment of the content), but because he wanted to do something that would get her to read more. Now, granted, I haven’t read the book series or seen the movie, so my comment stems only from the several reviews and articles I’ve read about them, but has reading become so important even to Christian parents that they feel the need to OK a book/movie for their children that gives at least the appearance of nominal approval to vampirism? Don’t get me wrong, I think reading is very important. I’m an avid reader, as are my children who are old enough to read independently. I guess I’m just a little perplexed that in a country with freedom of the press, where we have access to a bountiful supply of good books, both Christian and secular, that don’t contain questionable material, we are getting sucked into the mentality that the only way to get kids to read is to present them with books that contain and normalize profanity, occultism, gratuitous violence and gore, inappropriate and explicit sexuality, and any number of other things that we wouldn’t want them exposed to in real life. Why choose books like that when there are so many other better choices? Make it part of the daily routine- Just as you set aside time for brushing teeth, naps, daily devotions, homework, etc., set aside time every day to read to your children, or require your older children to spend a certain amount of time reading every day. One thing I have found that works well with my children is to occasionally allow them to stay up fifteen or twenty minutes past their bedtime, but only if they will use that time to read. Make reading something to look forward to– Several years ago, I began a practice of reading my older children a book series every summer. We started with the Little House on the Prairie books, then moved to the Narnia books and others. As we near the end of the school year each May, one of the things I have them do is start looking around the library and the internet for the book series they want us to read that summer. They look forward to this each year. Finding an appropriate author or a topic your children like and having them watch for the latest book to come out is another way to build excitement. Reward reading– Because I love to read so much, it is hard to for me to imagine anyone needing a reward for reading; it’s kind of a reward in itself! Some kids need a little more motivation, though. They might enjoy participating in reading contests such as Pizza Hut’s “Book It” program. Also, check out the programs at your local library. Our library sponsors a reading contest for both kids and adults every summer. It allows the reader to set a goal for the number of books he thinks he can read over the summer and then awards prizes for those who reach their goals. Or, if your kid is dying to see a movie that is based on a certain book, make seeing the movie a reward for reading the book. Set an example– Be a reader yourself. 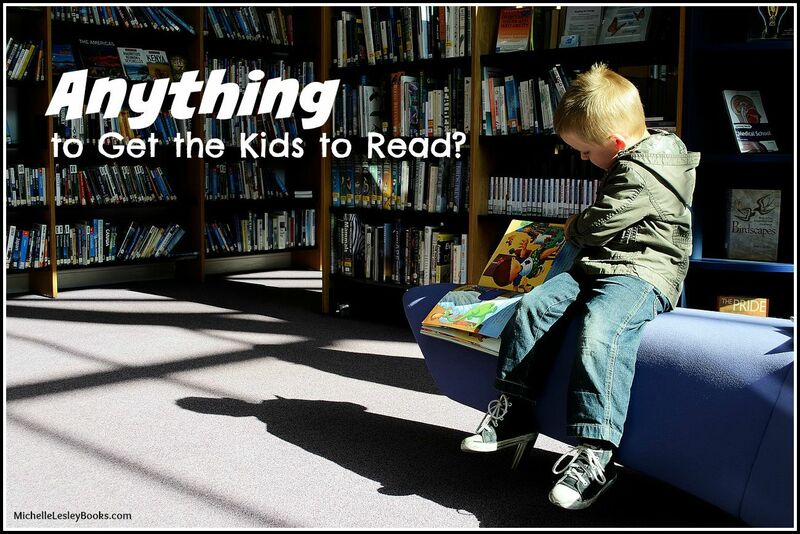 Find an interesting book and curl up on the couch with your kids while they read their books. Limit the electronic pacifiers– This is a good idea even if you’re not especially interested in getting your child to read more. Unlimited time in front of the TV, computer, gaming system, or hand-held video games is hazardous to your child’s intellectual health. Conversely, having your child read in order to earn “screen time” can be a good motivator. As with everything else, it’s important to abide by Biblical principles when choosing reading materials for ourselves and our children. Reading is important, but not as important as filling our kids’ minds with Godliness.